The latest adventure of science fiction's most famous time traveller has been published - and it brings him to Cornwall. St Agnes may be light-years from the planet of Gallifrey, but it provides the perfect setting for the new book featuring the Time Lord, Dr Who. The adventure, featuring the eighth incarnation of the Doctor, who was played on television by actor Paul McGann, is called Rip Tide and was penned by local author Louise Cooper. 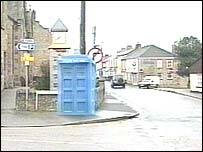 The Doctors arrives in his Tardis to save the village from catastrophe. Louise Cooper said: "Two strangers arrive, one of whom is the doctor. "He has been drawn here by a blip that he has detected in the space-time continuum that tells him something is wrong. "He then has to sort it out before it starts going so badly wrong that the whole village starts to have major problems."